This is the #1 ranked SEO book on all major search engines. The search engines love it. Thousands of webmasters have built their business using the SEO Book. And here's why. Get Ranked: Learn SEO Today! 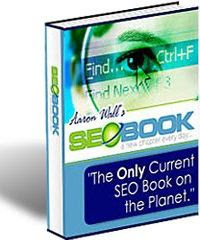 The SEO Book is an up-to-date 328 page ebook available for immediate download. Start learning SEO in less than 5 minutes. I got Aaron Wall's ebook about four months ago and have to say that it's hands down the best. He's definitely branded himself a the king in his field. Even other SEO's go to him for help. Glad you think so. I think the only people who don't agree are his competitors. :P But he's proven time and time again that he definitely knows his stuff more than most anyone.